American mathematician John von Neumann is considered a founding father of game theory (the application of mathematics to economic, military, political, and social conflict) and computer design. He first proposed a mathematical technique for analysis of conflict in 1927, and developed this into Theory of Games and Economic Behavior, co-authored with Oskar Morgenstern in 1944. 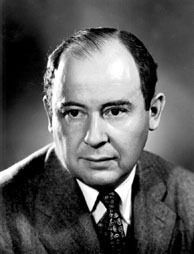 He was involved with planning and building the Electronic Numerical Integrator And Computer (ENIAC), the first general-purpose electronic computer, and his concept of computer design is still referred to as the von Neumann Architecture. He also calculated the first rigorous mathematical formulation of quantum mechanics as linear operators on Hilbert spaces, and developed the merge sort algorithm, by which the two halves of an array are first sorted recursively and then merged together. His research in shock wave dynamics helped determine the optimal height of explosions in attacks on buildings, his work on the Manhattan Project was crucial to the development of the implosion trigger for the first atomic bomb, and he was a key designer of the first US intercontinental ballistic missiles. He was born in Hungary as János Neumann, and appended the "von" to his name in his youth, when his father purchased a title of nobility. He was a high school classmate and lifelong friend of Nobel laureate Eugene Wigner. His daughter is the economist Marina v.N. Whitman.